FaceBook Stock Forecast – Should You Buy in 2019? Facebook has just released its 4th quarter earnings results, and they’re very positive for Facebook investors. And for investors in 2019, the question is whether Facebook is the best stock to buy and what earnings forecasts tell you. Facebook’s dominance in mobile advertising, active users, and engagement levels come from its place in consumers lives. Many feel Facebook is vital to their everyday lives. They log in and post frequently. Take a good look at the fundamentals of the whole programmatic advertising space and you’ll recognize why Facebook compares so well against other tech stocks. As one of the key FAANG Stocks, Facebook is one of the darlings of the stock markets. If you’re asking, as you do your retirement planning, whether you should invest in Facebook stock, the answer is likely yes. Today’s released earnings report shows Facebook is doing well in marketshare and earnings. 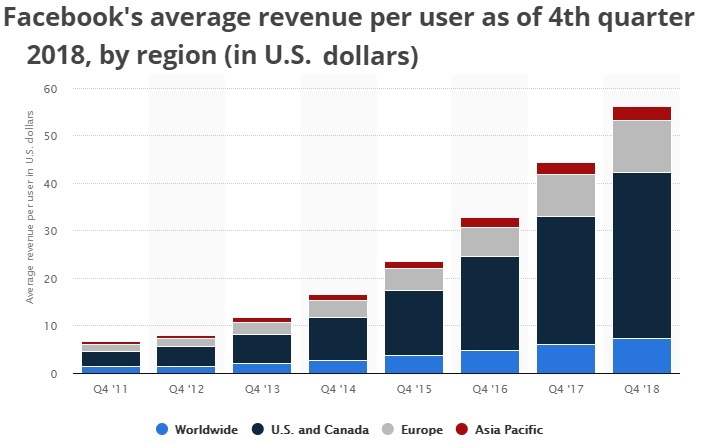 The big statistic is revenue per user which rose $7.37, and users are rising. It raised expenditures in 2018 and it paid off well. Facebook’s stock price has jumped in after hours trading to $163. 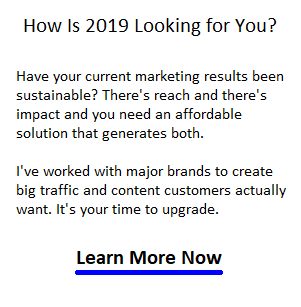 Facebook’s popularity with young and old consumers across many social platforms, along with its dominance in mobile internet advertising revenue gives it special value in your stock portfolio. Its revenue is sustainable and it is firmly placed as a solid stock to invest in. There are threats. European regulators are in a foul mood and it’s rumored Facebook could be facing Google sized fines for GDPR non-compliance. The potential fine of $1.63bn could put a dent in profits. Yet, what could happen if China opened to Facebook usage? That’s why people like you are inquiring. Enjoy the data, insight, videos and charts below. The future of social media is excellent and Facebook’s business model is excellent. They collect all the advertising money they make and share it with no one. Facebook dominates social media platform use by all age groups and haven’t even figured out how to maximize advertising revenue. Increasingly, Facebook has positioned itself as the only social media channel. 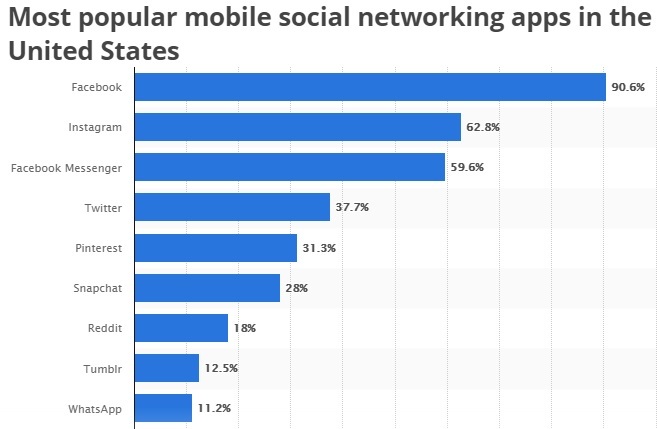 With Twitter and Linkedin struggling to remain relevant, Google+ disappearing, and Pinterest as a cottage pastime site, Facebook is left with a monopoly on social media. 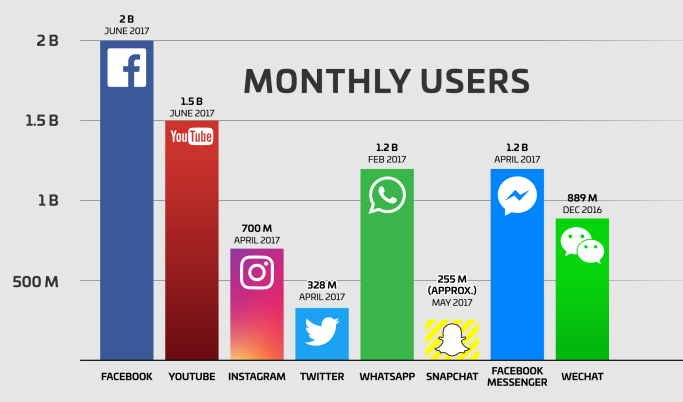 Facebook earns 93% (87% last year) of its revenue via mobile media and the might tell you why Google is emphasizing mobile now. 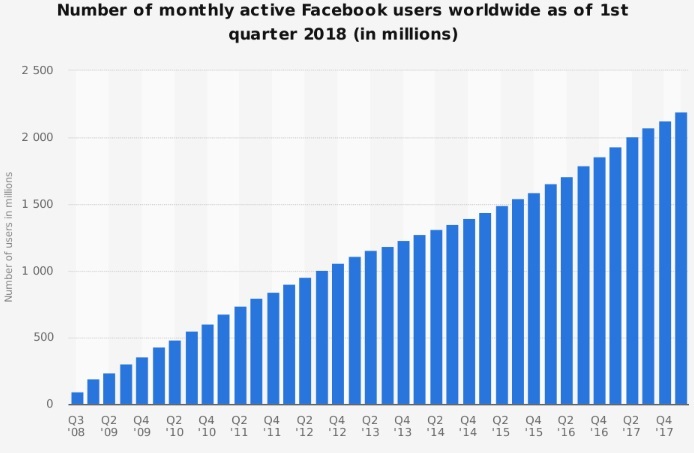 Facebook’s userbase continues to grow, now at 242 million in North America. Worldwide, Facebook has entered the lives of 2 Billion people. Will its revenue stop growing? Did McDonald’s revenue stop when they maxxed out in North America? On January 31, analysts expected a report of record profit report for 4th Quarter and the actual results are better than expected. 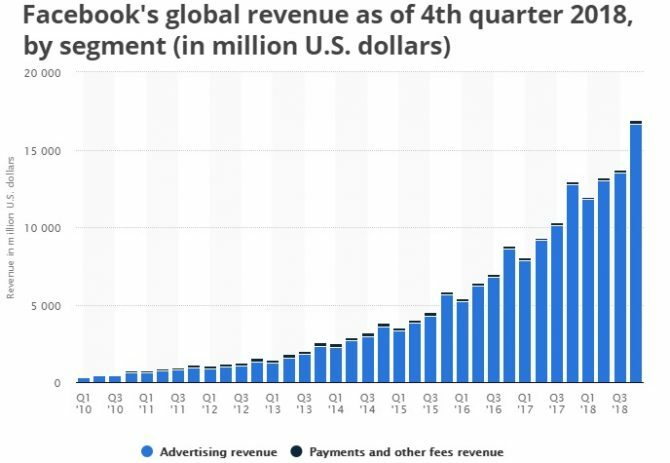 Facebook earned $40 billion in 2017. Stock analysts expect a record profit of $6 billion for the 4th quarter of 2018 (actual was $6.91 Billion). That is $2.9 billion more than 3rd quarter 2017, and $1.9 billion higher than any quarter in the company’s history. This rosy report should elevate its stock price and encourage buyers to get in on some good dividends in 2019. Estimates for earnings per share are $2.21. The stock is down 24% since last July due to bad news and a slipping economy. CNBC’s cast of 45 analysts weigh in on where Facebook’s stock might go in the next 12 months. 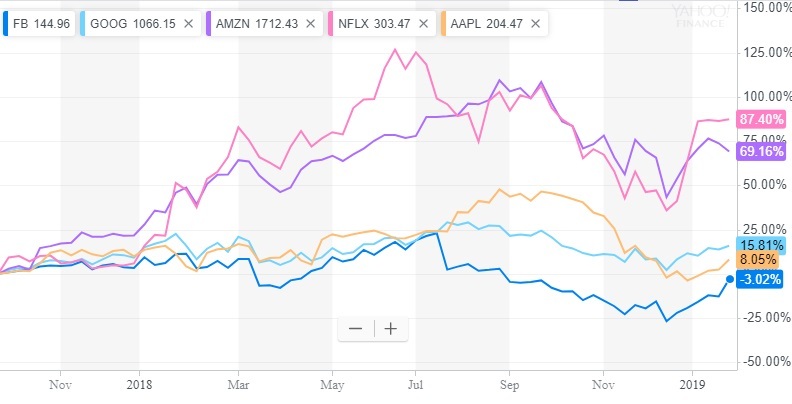 Only Netflix and Amazon complete with Facebook’s price surge of late? Is this category in a bubble or ready to explode? Finding a downside in the picture is difficult. No real competitors are presenting themselves and their global userbase should grow for many years. If you use Facebook, you know how much less intrusive its advertising is. They’ve got lots more opportunity to grow ad revenue via FB, Messenger or Instagram. Ad revenue from Instagram is expected to make a big difference in future. Consider that Facebook will have to the two top platforms for young and older users. Monopoly is the goal and they’ve got it. Facebook bought Whatsapp for $19 billion but it hasn’t earned much money so far. 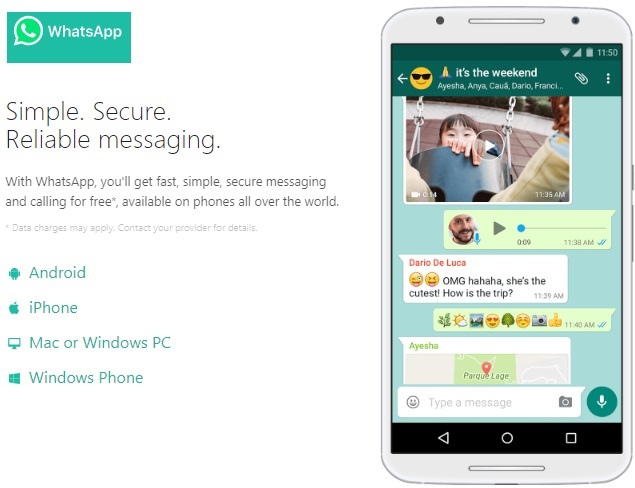 Worse, a number of rival SMS technologies put the success of whatsapp in question. Forbes believes in it, and says its ad revenue will be $5 billion per year by 2020. Userbase is only at 23 million so there’s plenty of potential if it can penetrate the North American business market. Together with Google, Facebook almost owns Internet advertising. It would be hard for any startup to get established against them. Facebook’s advantage comes from the user identity and behavioral data they collect. The company has used that data to feed into artificial intelligence systems to predict customer behavior and thus show more relevant advertising to stimulate buying intent. This is an enormous advantage over smaller firms who know little about users online behavior. A recent estimate by 44 stock analysts predicts a median estimate of a 27.5% increase in Facebook stock value. The range they projected was from a high of 275 down to a low of 149. So the experts are divided about Facebook’s future value. Long forecast has set a Facebook price of $151 in 2021. 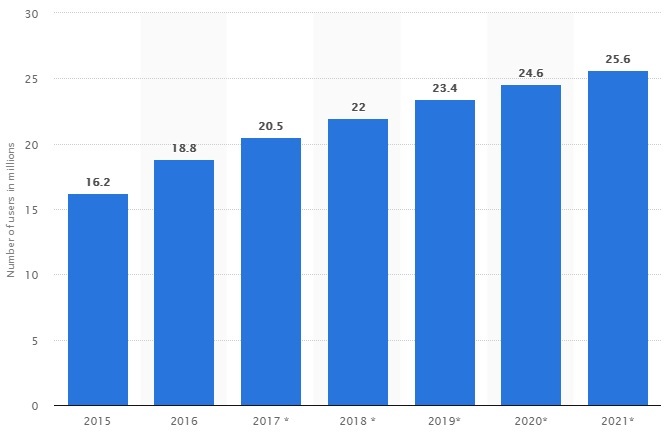 Instagram is Facebook’s cash cow, expected to earn $14.4 billion in world-wide sales, which amounts to 4.4% of the global ad market and 6.2% of the global mobile market. There’s lots of room to grow. Facebook’s stock value has risen of late. We’re seemingly through the worst of the mini-recession and the US economy is ready to take off once again. 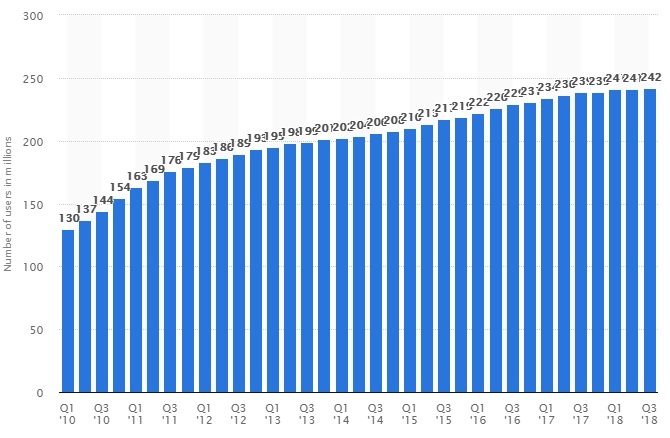 Since Facebook gets most of its revenue in the US, a rising economy bodes well for Facebook ad revenue, just as it has the last 5 years. Facebook’s stock performance correlates positively with the US economy. Facebook is one of many corporations expected to buy back a lot of their stock in 2019. Goldman Sachs believes there will be $1 Trillion in buy backs this year. The company has designated $9 billion to buy back shares. Share buy backs are generally considered a positive sign for future earnings. Should You Buy Facebook Stock? 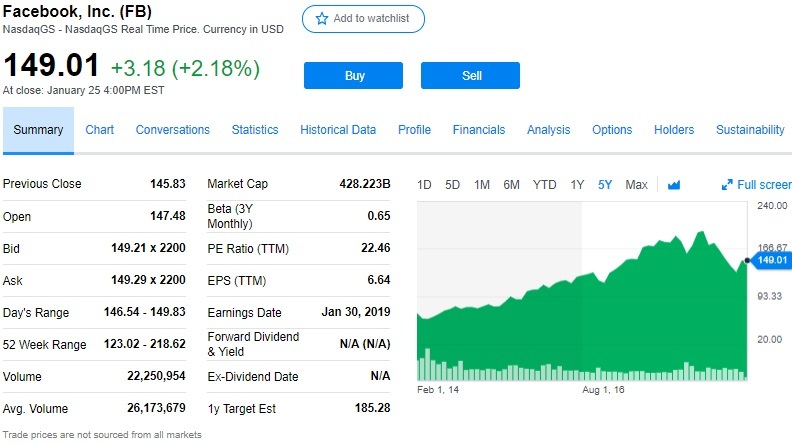 There are plenty of high flying stocks that could offer better stock price appreciation, stronger P/E ratios, and higher dividends, yet Facebook is one of those solid stocks you should have in your portfolio. It has almost Blue Chip status. Check out the state of the stock market and the best stock picks for 2019, and be familiar with the DOW forecast, S&P forecast and NASDAQ forecast. Review the predictions for all of the FAANG stocks. The predictions of some experts and media people are for bond price increases, right now with Fed Chair Powell pushing interest rates up. The equity markets still have a long way to go. Don’t believe the pessimists. The US economy will soar and that will fuel a rosy 2019 housing market forecast. Good luck with your stock portfolio this year.